Granola in an elegant gift tote. What a classy way to express your wishes for a happy and healthy holiday season. These elegant gift totes feature a raised glossy dot pattern over a matte background. Metallic black and gold wrapping papers add a festive look, and a glittery tulle bow adds the perfect touch of sparkle. A gold-foil gift card is also included. One 10-ounce pouch and up to 12 single-serving snack packs. Two 10-ounce pouches and up to 6 single-serving snack packs. Up to 24 single-serving snack packs. 1. 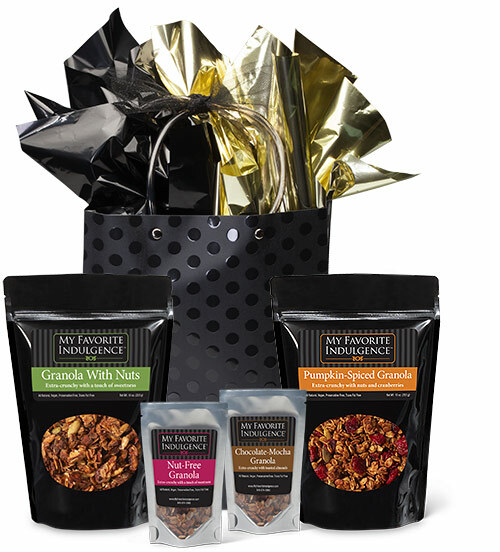 Select the granola packages and flavors you would like to include in your gift bag and add them to your shopping cart. 2. Add gift wrapping to the shopping cart. 3. Use this "Contact Us" form to tell us the address where you would like your granola gift to be shipped and the message you would like to appear on the gift card. You can also give us a call at 949-874-5965.